House Speaker Paul Ryan (R., Wis.) took to the House floor Thursday to defend the Foreign Intelligence Surveillance Act (FISA) and to criticize the "Amash amendment" in the debate over reauthorizing the surveillance authority. FISA's 702 program, which must be renewed by Congress in order to remain active, gives the government authority to conduct foreign surveillance on U.S. soil. It permits the NSA and other security agencies to, without a warrant, collect the emails and other communications of foreigners abroad, the New York Times reported. The amendment discussed was chiefly sponsored by Rep. Justin Amash (R., Mich.), and would ban security agencies from reading private messages from American citizens. Ryan began his remarks by saying he respects the passionate views his colleagues, including Rep. Justin Amash (R., Mich.), have on the issue, and thanked House Minority Leader Nancy Pelosi (R., Calif.) for speaking out against the amendment and supporting the underlying bill. He further said he would like to "bring a little clarity" to the debate. Ryan said the bipartisan agreement, which was passed by the House on Thursday, would "add even more privacy protections to the law." "This is about foreign terrorists on foreign soil," Ryan said. "That's what this is about." Ryan proceeded to give declassified examples of when information collected under FISA prevented terrorist activity. One example outlined how information allowed authorities to track down and kill the ISIS finance minister–the terrorist's organizations no. 2 leader. Ryan emphatically described a "firewall" that existed before Sept. 1, 2001 that prevented American intelligence agencies from having necessary information for national security. "We were seeing what was going on overseas … and we couldn't pass that information on to our authorities here in America," Ryan said. "We had this firewall that prevented us from connecting the dots." "You pass the Amash Amendment, you bring that firewall right back up," he said. Ryan further argued that if the overall bill fails, Amash's concerns about privacy will face worse consequences. 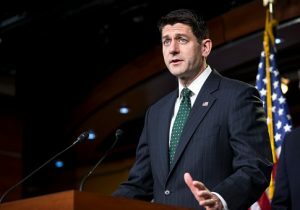 "If this underlying bill fails, there's one of two things that will happen: the status quo will be continued, meaning no additional privacy protections, or even worse, we go dark, 702 goes down and we don't know what terrorists are up to," Ryan said. Ryan called on his colleagues to vote no on the Amash amendment and yes on the underlying bill to renew FISA 702, arguing lawmakers are supposed to make the "decisions to keep our country safe." "This [bill] strikes the balance that we must have between honoring and protecting privacy rights of U.S. citizens, honoring civil liberties, and making sure that we have to the tools we need in this day and age of 21st century terrorism to keep our people safe," Ryan said.